I’m an art critic — get me out of here! You could hardly ask for clearer evidence of the road to hell being paved with good intentions than the 56th Venice Biennale. The good intentions belong to the event’s chief curator, Okwui Enwezor, a Nigerian-born New Yorker who has correctly noticed that the biggest storyline currently playing out in art is the arrival of scores of newer and angrier nations seeking to elbow out the old guard and grab a seat at the head table. Internationalism is, indeed, the big game in art right now. 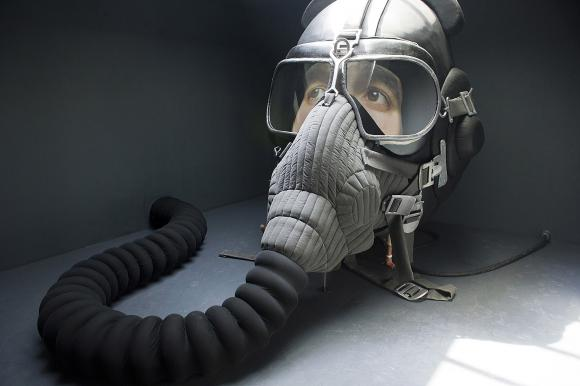 The current biennale includes official representations from 89 countries. In 1999, there were 61. Thus, from Scotland to Tuvalu, from Mozambique to the Vatican, a cascade of locations that did not previously have a voice now do. So, those are the good intentions. To hear from the unheard. The hell is the resulting event, a show so disfigured by the culture of complaint, so grimly and nocturnally artless, so packed with moaning videos and repetitive identity narcissism that I would list it as the most depressing biennale I have attended. If this is the future of art, then get me a Tardis, quick. To envisage the tone, texture and presence of All the World’s Futures — as this dreary polytechnic lecture is officially entitled — all you need to know is that the central event of the central show is a live reading of Karl Marx’s Das Kapital that is set to continue for the entire seven-month run. Perversely, the surrounding shipwreck is never actually about the future. It’s always about the past. The very first thing you see upon entering the biennale gardens, where the national pavilions are gathered, is a row of mock monuments to George V created by a collective of Indian artists called Raqs Media. The monument, based on a real coronation monument in Delhi, has been altered with amputations — the king has had his face cut off — while the inscriptions on its base are quotes from Orwell’s famous essay on the shooting of an elephant. Thus, Britain’s colonial past gets the first of many bashings in what turns out to be one of the wittiest works at the biennale. The problem here is that the culture doing the bashing — the curatorial culture that has taken over art, led by Enwezor himself, who studied “political sciences” at New Jersey City University — is a much more successful colonist than Britain ever was. Everywhere you turn in this grim marathon, whichever country you visit, you encounter the same things: a dull mix of texts, graphs, installations and videos, prefaced by yard after yard of meaningless curator-speak. I set off with high hopes to My East Is Your West, a satellite event at which artists from Pakistan and India are sharing a cultural platform for the first time. They were dashed by the opening wall caption, which informed me that the show is “a proposal towards a shared cultural cartography where we meet beyond fixity”. I wonder how well that has been explained to the poor village sod sitting in the final room, drawing thin lines onto 3,359.59 metres of cloth, “hand-woven on the Indian-Bangladeshi border”, as a comment on the 3,359.59km fence that has been erected between the two nations? If the artist or the curator had tasked themselves with scribbling lines for seven months, it would have been boring, but acceptable. To hire a village minion to do it is colonial exploitation as regrettable as the activities of any high-street retailer. Corner after corner of this scary event is so busy accusing capitalism of “the economic exploitation of underdeveloped countries in the Global South” that it does not recognise itself doing the same thing. In the main Arsenale exhibition, Rirkrit Tiravanija, born in Argentina, educated in Thailand, ruined as a thinker in the United States, has hired some unfortunate Chinese brickmakers to spend the biennale mass-producing bricks stamped with situationist slogans. Stop buying other people’s sweat, Rirkrit. Make the bricks yourself. Across the entire biennale, the international curator culture that Enwezor heads up is eradicating native cultures more successfully than any western colonists ever managed. In the old days, you could walk into the Mozambique pavilion and find art from Mozambique. Today you find video screens and cultural archeology united in a display of “contemporary art production focusing on traditional and modern objects to explicate the relationship of art to spirituality”. How many people in Maputo would have a clue what that means? In the Belgian pavilion, a giant computerised machine that moves numbered blocks from one location to another — called, typically, Negative Space: A Scenario Generator for Clandestine Building in Africa — claims to be critiquing the exploitative arrival of modernist architecture in Africa. Created not by a Belgian but by James Beckett, a Zimbabwean who lives in Amsterdam, this impressive slab of precision engineering must have cost as much to make as an African family needs to feed itself for a year. With the big story of the biennale being the colonisation of international art by an aggressive curator class, it is left to a few small pockets of resistance to supply some crumbs of difference. Chief among these heroic resisters I would place the British pavilion, where the ungovernable Sarah Lucas has created a big, loud, boisterous installation set against an unmissable expanse of custard yellow. It’s the best thing in the biennale. Lucas possesses a voice that has never previously been allowed into art — the voice of the mouthy Great British ladette. 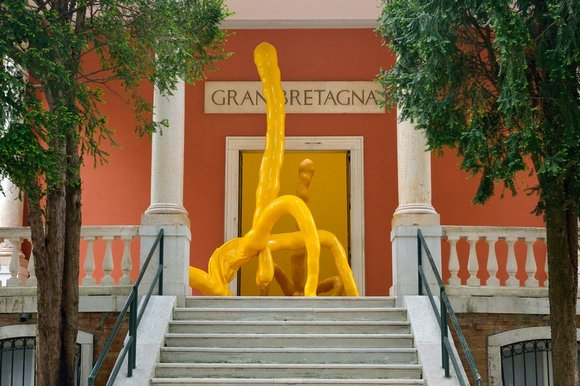 Her spirited attack on masculine attitudes to femininity commences on the veranda of the British pavilion, where a huge biomorphic sculpture made of yellow blobs appears to be sticking a finger up at the Venice biennale. Only when you get closer do you see that the blobs form a rough approximation of a male figure that has arched its back acrobatically to flash its testicles at you. Called Gold Cup Maradona, the big yellow sculpture pulls off something I am absolutely certain nobody has attempted to pull off in art before — a combination of football moods with the priapic symbolism of the ancients. Inside the pavilion, this fearless blending of modern and ancient continues with nine rough-and-ready plaster casts of the bottom halves of women — one for each of the nine classical muses — that have draped themselves across various household appliances like the glamour models who drape themselves across car bonnets in lads’ mags. With one important difference. These particular bottom halves have cigarettes sticking out of their intimate orifices. All this can easily be mistaken for a show with the scatological ambitions of a seaside postcard. But it’s actually a feminist call to arms that has set out to confront the Photoshopped female unreality you find in fashion magazines and page 3 layouts. Infused with the spirit of Hogarth and Rowlandson, punchy and brave, this is art so quintessentially British that no amount of international curating will ever shut it up. 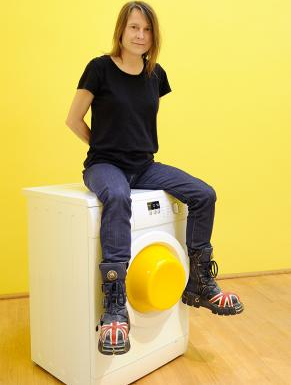 Bravo, Sarah Lucas. The ungovernable Russians are another nation that refuses to become like everyone else. In an excellent moment of transpacific solidarity with the art of Easter Island, the veteran Russian conceptualist Irina Nakhova confronts us with the giant head of a cosmonaut, whose video eyes follow you around the room. 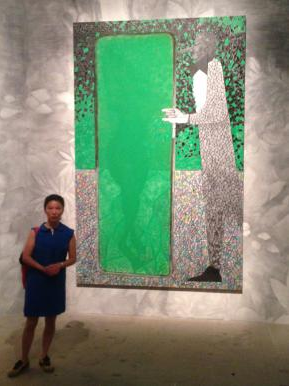 I also enjoyed the gorgeous suite of new paintings set against an atmospheric grey background by Chris Ofili, who is onto something unusually beautiful in his new symbolism. That’s just about it for the good news. Elsewhere in the biennale, there is too little encapsulation and too much accumulation. Display after display is happy to spread out the ingredients — texts, archives, photos, memories — and leave us to cook the dinner. It’s a process of creative abnegation that reaches a climax in a room devoted to Harun Farocki, a German film-maker who made 120 films in 50 years, 87 of which are playing simultaneously and unwatchably in the Harun Farocki alcove. Ridiculous. And as with all recent biennales, lurking behind the black curtains there’s usually another Ancient Mariner determined to confront you with the story of their origins. When Warhol prophesied so presciently that one day everyone would be famous for 15 minutes, he badly underestimated the time needed for all the narcissistic identity-seekers in the world to make 90-minute videos featuring the memories of their grandmother. Art is in trouble. It needs to get rid of the political-science hobos who’ve jumped onto the gravy train and to start dealing again in the tangible and the visual.